Protect the contends of your bulk bins from dirt, dust, moisture and other contaminates. Our elastic band poly dust covers are made from durable 4 mil poly. This shower cap design dust cover is ideal for all containers up to 40x48". 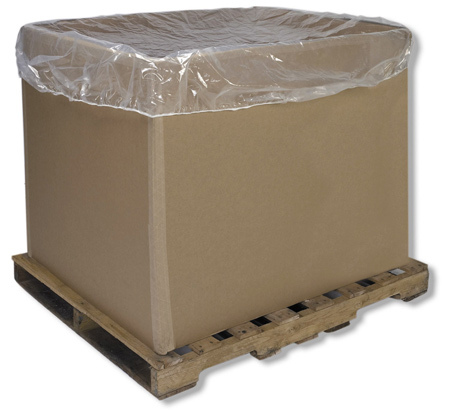 The Gaylord box dust cover can stretch up to a 64" diameter. SQUARE CAP, Sold by the cap, minimum order is 25 caps. Poly dust Caps made from strong 4 mil polyethylene that meets FDA specifications. 25 per case, price below is per dust cover. Sold by the cap, minimum order is 25 caps. Order in multiples of 25. Sold by the cap, minimum order is 25 caps.